Baseball is on my mind today. And for some reason I’m calling back that old baseball movie – Bull Durham – and the “I believe” soliloquies that Susan Sarandon and Kevin Costner deliver so well. I believe in the church of baseball, she says. I believe in the soul, he says. They are two things at once, both invitation and declaration. An invitation to look inward and ground ourselves in what we know. A personal declaration of what truly matters to us. looking, really looking, into someone’s eyes each day. the wisdom of your imagination. letting things reveal themselves rather than trying to force them. finding mentors in unusual, unexpected places. the inner voice that rises up and demands to be heard. 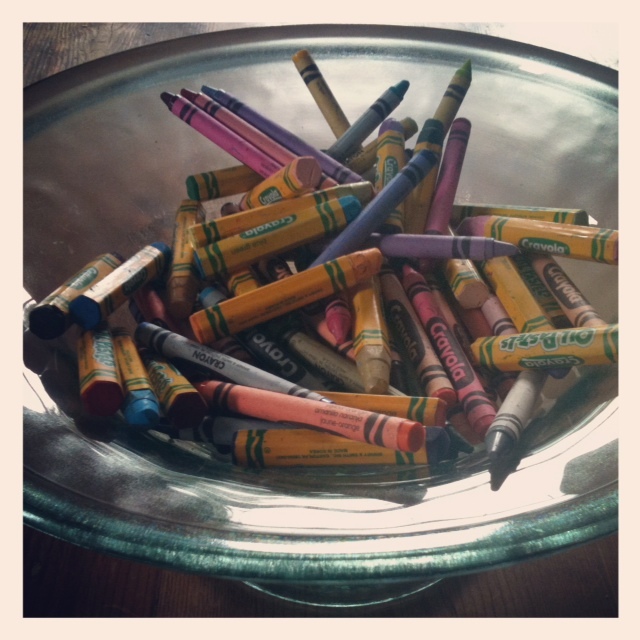 keeping a big bowl of crayons on your kitchen or dining room table. telling the story of your life as if it were a fairy tale. telling people how much you appreciate them. our capacity as human beings to create meaning. touching base with the moon and the stars each night. the power of relationship to foster change. writing love letters to your dog or cat or other pet. planting things in the earth and tending them. creating the future while living deeply right now. This offers me a new perspective on baseball, which in the past I have admittedly seen as boring and opposed to creativity (I think this relates to how I felt being taken to baseball games as a kid) — it’s heartening to see that it can be a source of creative inspiration for someone. I love what you believe in. We are not raised to believe in what we believe in, we are supposed to believe in whatever makes big money for a small group of folks. To chase that elusive casino dream that if we just make a wad of money, we will finally be fulfilled and happy. It’s time to shake it up and let the young find their own things to believe in. And most of them are free. Appreciating others is terrific. When we are constantly in competition for this wad of cash, we lose sight of the beauty that surrounds us. If we all worked together, more folks would be above the poverty line and there would be more dancing in the streets. I wrote a piece on my fearless design blog called, “Redefining The Bottom LIne.” It’s on my mind more and more lately, this economy we all keep running around wanting to crank up. Does this version really work? Thoughts to ponder. Crayons are a super idea. Maybe, we should give out free crayons on the corner? “That elusive casino dream” : you have a way with words that always nails it, G. I agree with everything you say. Crazy how we all worship at the altar of the almighty dollar. Thanks much for your always cogent comments! I believe in trying. Even if the efforts fall slightly short, I know I have my best. I believe in listening to others, but also to myself. I believe in following my intuition; it hasn’t failed yet! I believe in people who remind me to believe…. I hope all is well with you. It’s been awhile since I’ve visited. So nice to see you here, Sara. I’m good and hope you are too. Love what you believe in! And for the moment, that’s enough for me! Oh, I’m so excited to hear that you’re writing a letter to your sweet old dog, Charlotte! As my kitties have aged I’ve done this many times. Writing to them about how much I’ve loved them and remembering/appreciating them, then reading the letter to them, brings me many smiles and tears. It is such a meaningful experience. Let me know how it goes.